I took a walk this afternoon. This time I went west. I found the big chocolate factory. There is a street behind the factory called Chocolate Avenue (sign at right in picture – the big white building is the chocolate factory). Now I understand why Arthur likes to visit his brother in Montrose. Call this daily tree #2. Tomorrow, Arthur and I drive northwest. It looks like we’re not going to meet Arthur’s friends in Reno, so we’ll be heading straight for Portland. Our holiday adventure is coming to a close. We’ll have a bit over a week in Portland and then we return to Alaska. I went to Madison with my friend Bob. He had to do a radio interview, related to publicizing his upcoming concert which he is conducting. While he was in the radio station doing his interview, I had some time to kill walking around Madison. I have never lived in Madison, but I have spent a lot of time here over there years, because it’s where my sister went to grad school, and where several friends also went to grad school, and of course now, where my friend Bob teaches and conducts music. 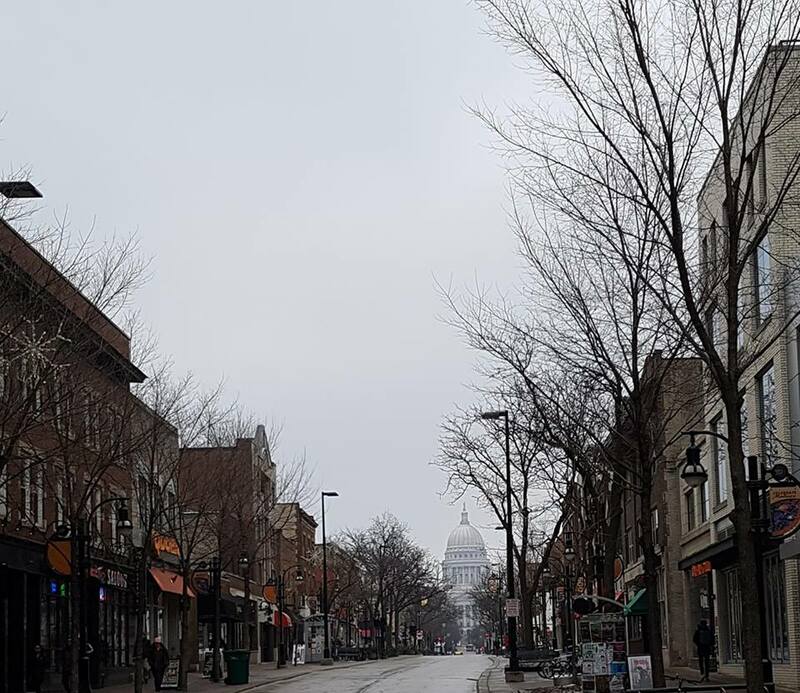 I took this picture looking up State Street, which connects the state capitol building (in the distance) with the university campus (behind me). My friend Doug has long described Madison as “Disneyland for college students” and that seems an accurate moniker. It’s everything you want in a college town. Madison occupies a striking isthmus between two lakes. 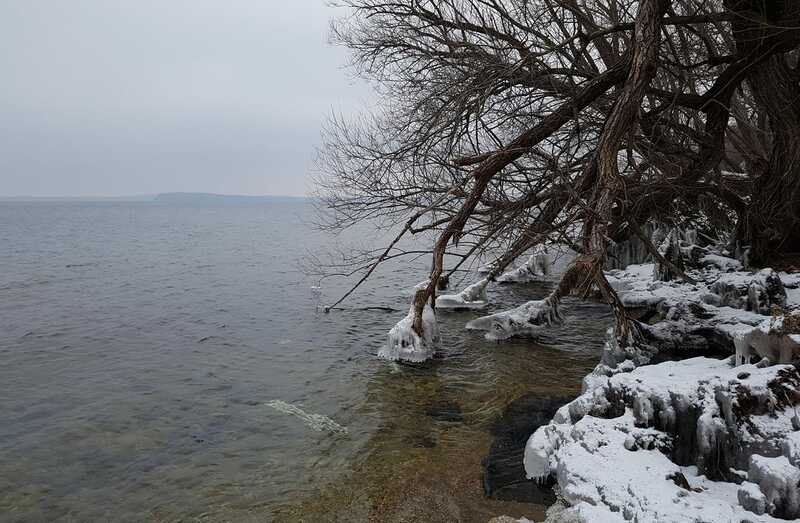 So a few blocks north of State Street you’re on the shores of Lake Mendota. 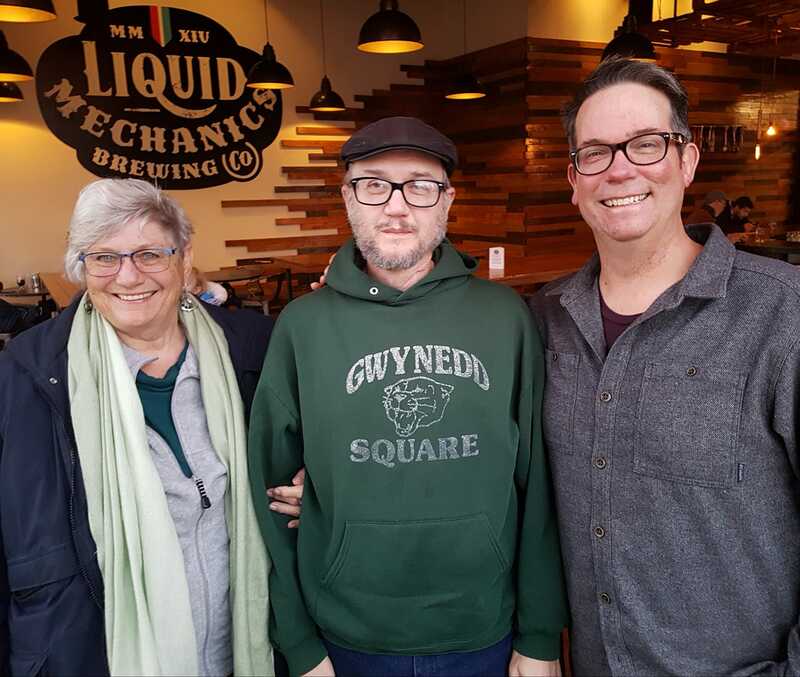 Later, after his interview, Bob and I met with Martin, who is the son of my friends Mark and Amy who I just finished visiting up in Eagan, Minnesota. Martin works in downtown Madison, so it was easy for him to get away from work and have lunch. I found a place selling poke. 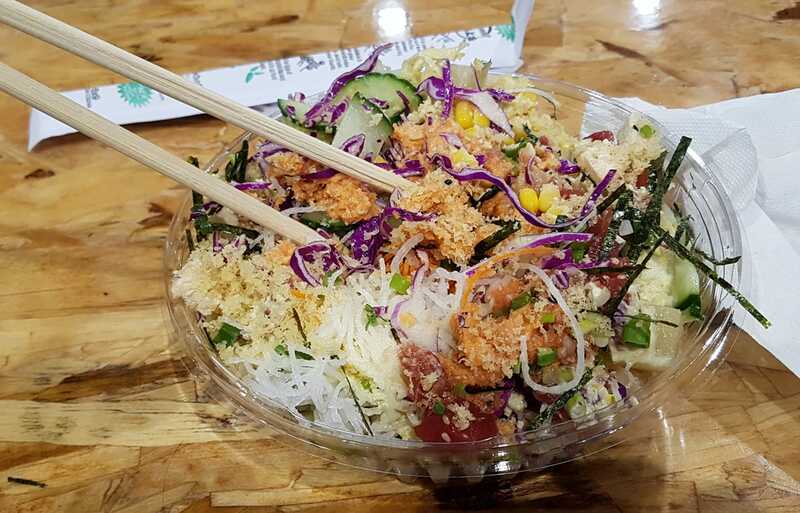 Poke (/poʊˈkeɪ/) is a bit like a Hawaiian version of 비빔밥 (bibimbap) or 볶음밥 (bokkeumbap). You mix rice with various toppings, including raw or cooked fish, veggies, and sauces. I had one with very hot sauce and raw tuna and tofu. It was delicious. Here is a selfie of me, Martin and Bob at the poke joint. Later, I took a long walk to a nature reserve north of Bob and Sarah’s house. 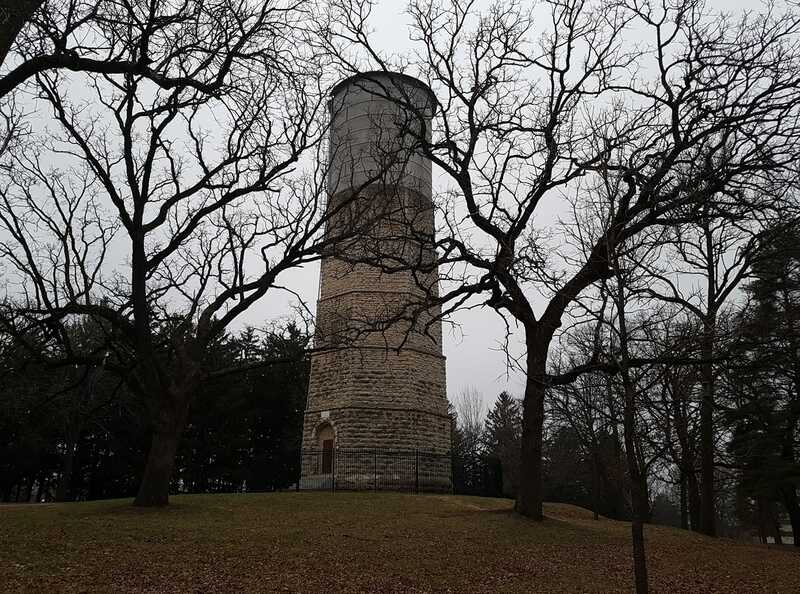 I went past the photogenic Whitewater water tower. 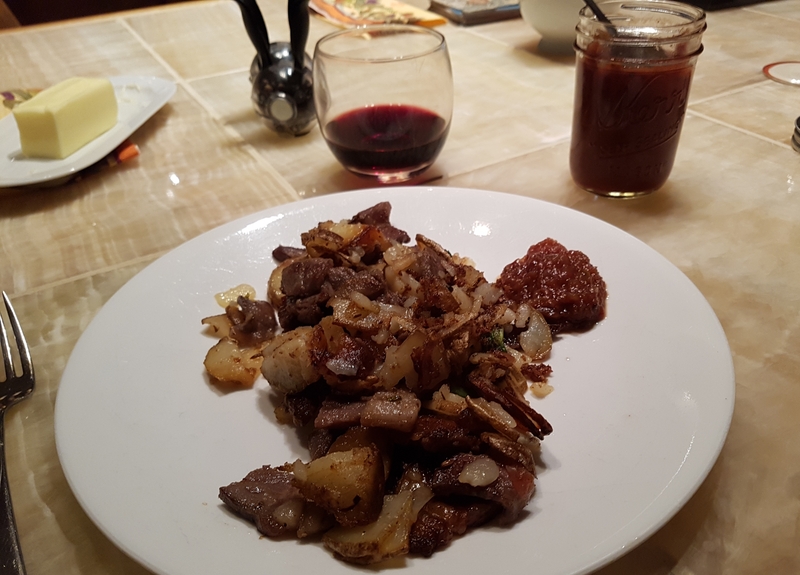 Last night, using leftovers from the previous night, I made a chopped roast hash with potatoes and stuff, and we used the jar of chili sauce that Juli had sent with me to gift to Mark and Amy as garnish. It was pretty good. Today, I didn’t do a lot. 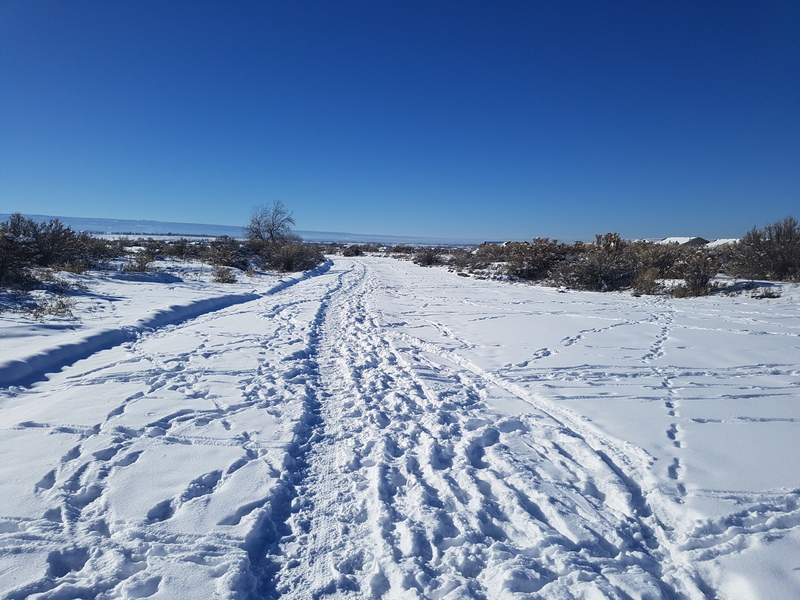 It was one of those “days off” that is part of this cross-country misadventure. 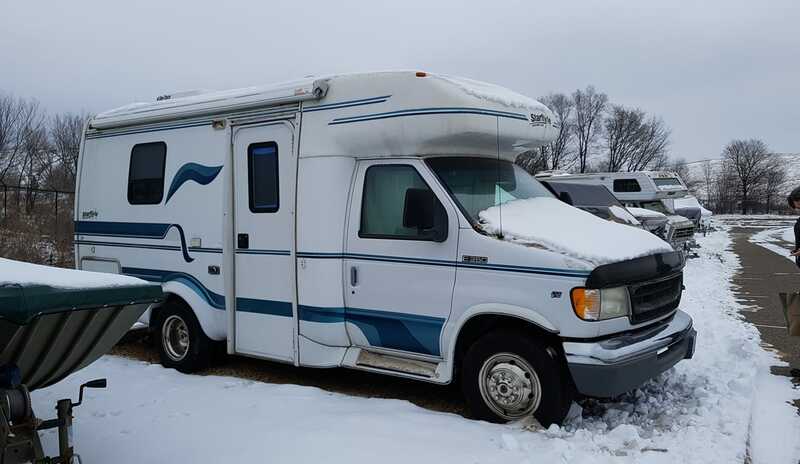 One thing: Mark has his parents old RV in an outdoor storage (guarded parking) location. We went to check on it, and the battery was dead. We got very cold taking out the battery. Arthur pronounced it "acceptable" – which is praise, in his language. Wayne liked it too. I got one full day off before the slew of appointments resume with Arthur. So we took a walk up to the tree farm. There were a lot of ripe blackberries along the road, so he and I picked berries, and brought them back to Juli's house. 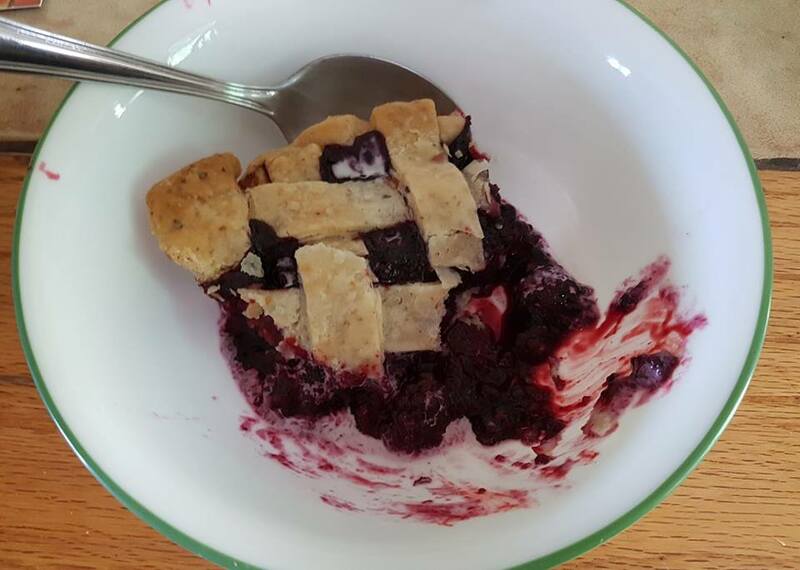 Juli made a blackberry pie. Blackberries remind me of my childhood, since my home in northern California was surrounded, as Juli's home is, with abundant wild blackberries. My body is still sore and achey from my storage unit adventures last week. When I lived in Valdivia, Chile, in 1994, I stayed at a guesthouse (casa de huéspedes) while I took classes at the Universidad Austral, which was a kilometer walk across the river on the island. 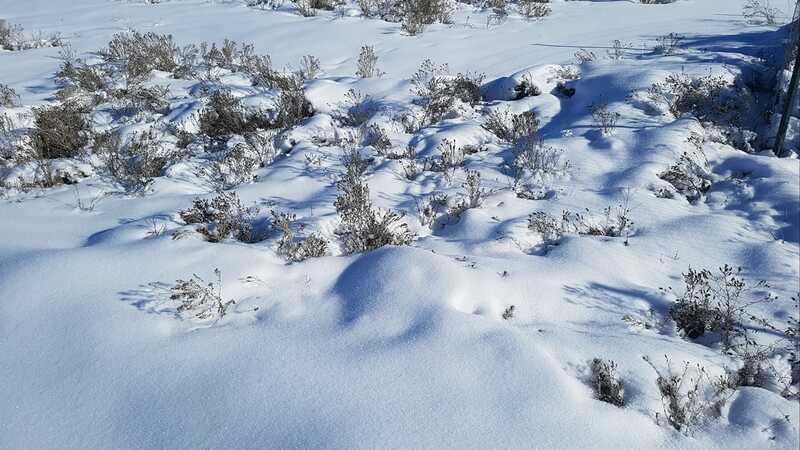 That was a very cold several months, living there, because it was the Chilean winter, August-October, and the Chileans don't believe in any kind of central heating, and the guesthouse wouldn't allow electric space-heaters in our rooms. 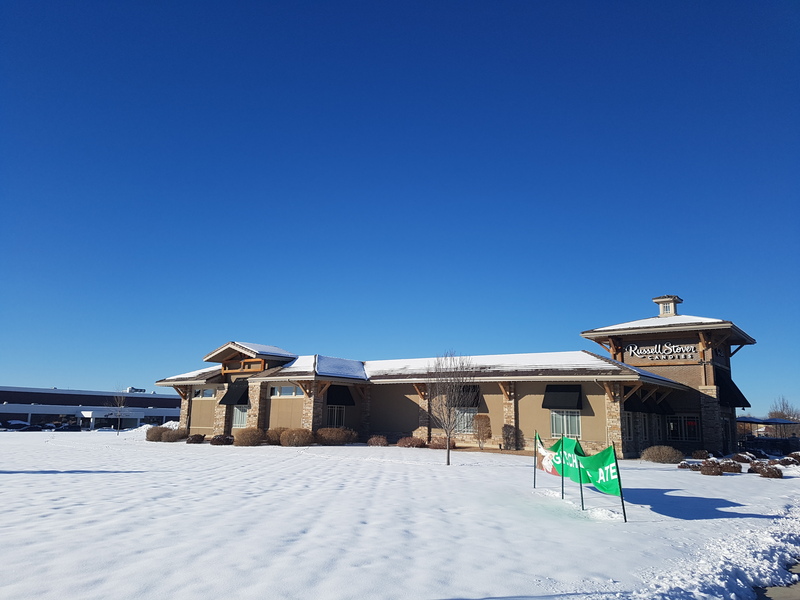 It only snowed once, but it was always hovering right above freezing, with neverending drizzle and rain and overcast skies. So I would huddle in the guesthouse's dining room, by a wood stove there, when it was lit. 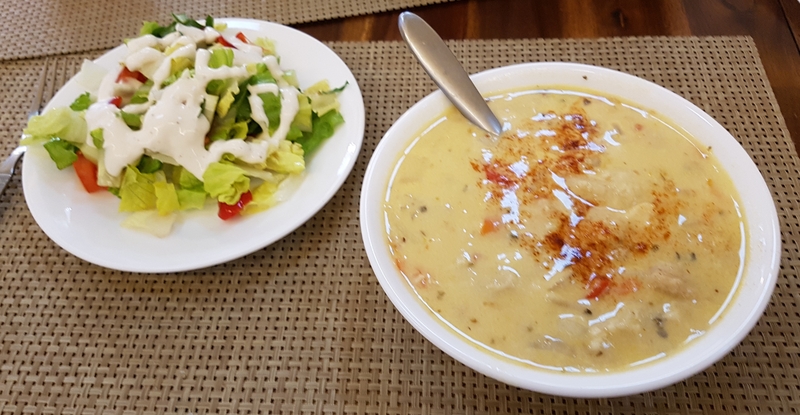 The landlady's cooking was a unique style in my experience. She was German-Chilean, but several generations removed from Germany. I have no idea what to call her cuisine. What was memorable were the single-dish meals she served, made of pasta or rice, always with some kind of tomato-based sauce, sometimes with meat, generally with beans, and always with a fried egg or two on top, which I would mash into the concoction before eating. It wasn't particularly delicious, but it was always reliable and filling. I don't know if this cooking style is common in Chilean homes, or even, specifically, southern Chilean or German-Chilean traditions, or if it was more idiosyncratic to that guesthouse's landlady. I did experience something similar at a hotel restaurant in Punta Arenas, but with ñoquis (gnocchi), possibly due to the strong Argentinian influence down there (Punta Arenas is only connected to the rest of Chile by road via Argentina), as I think of ñoquis as being very characteristically Argentinian. Sometimes, in the years since, I have made various half-hearted efforts to recreate what I think of "Chilean tomato glop with egg". The other day, I can proudly say, I came as close as I ever have to recreating the look and feel of the original. 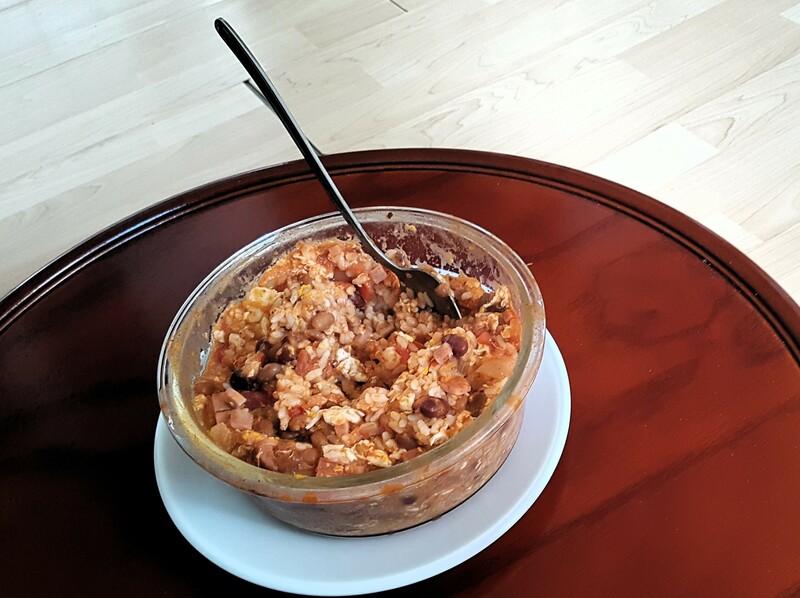 I was finishing off a batch of rice, using a fresh tomato and onion and some leftover chopped ham, I added in half a can of Mexican canned beans (yes, you can buy that in Korea) and two poached eggs. I can't comment on the taste aspect, given the radical transformations my taste-buds have undergone in the intervening years. But anyway, I was happy with having accomplished it. So I took a picture. In fact, I wasn't that scandalized – I could barely contain my laughing. But given my in loco parentis role (more loco than parentis, perhaps), I felt obligated to be upset by the performance. 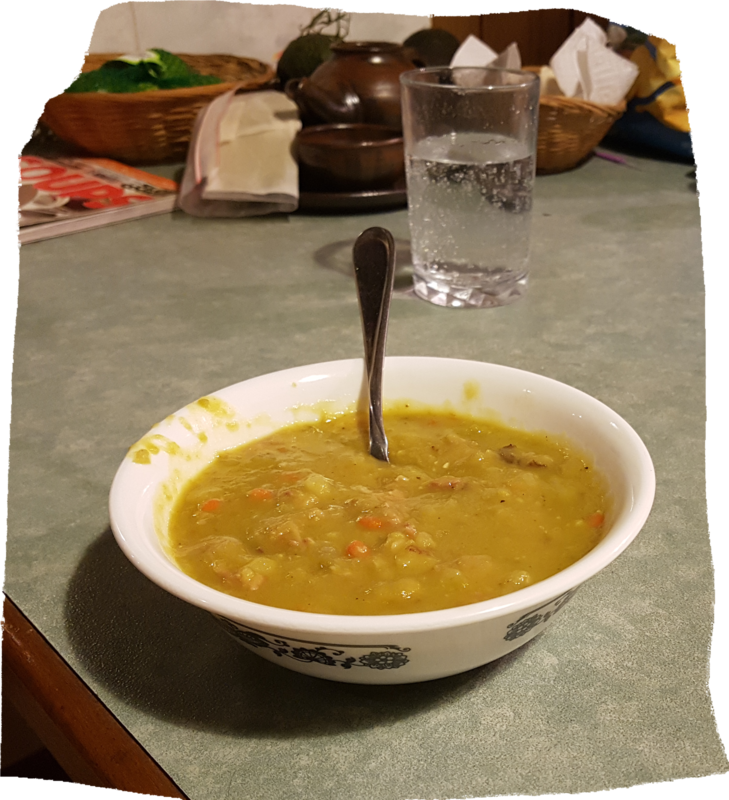 If you have watched this blog over many long years, you know I happen to like pea soup. My mother likes to cook sometimes, so when she asked if there was anything I was craving, I told her I hadn't made pea soup for myself in a long time. I think I just got lazy, after the cancer thing dulled my tasting ability, and I just haven't bothered in recent years, since everything I make that I crave ends up being a bit disappointing. Anyway, we bought the ingredients and she made pea soup. In fact, I already knew it wasn't something she commonly made – I grew to like it after I was living on my own – it's not anything like a "nostalgia" dish from my childhood. But I was quite surprised when she announced, after we were eating it for dinner, that it was the first time she'd made pea soup. It was a good pea soup, I think. Yesterday morning, I went into Seoul. 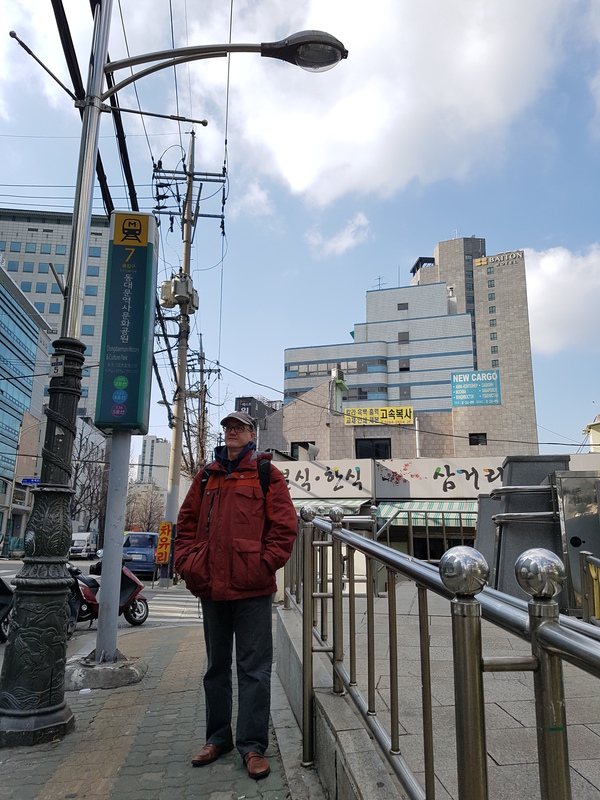 I travel so rarely, these days, even to just go into the city for a half-day – it was the first time I've left Ilsan since returning from my North American odyssey last November. My friend Peter is on the Peninsula, now that he's a grad student specializing in Korean Studies, he has reasons to come back to visit, and apparently he managed to make it quite affordable. We met in that area around Dongdaemun that I have always called "Russiatown" – it's one of my favorite neighborhoods in Seoul, with much of the same "international" or cosmopolitan feel of, say Itaewon, but without the pretentiousness or gentrification, and fewer "fratboy" tourists, as the US soldier-on-leave crowd in Itaewon always seems to come off as. Nevertheless, I would say that "Russiatown" seems a bit gentrified, lately, too. Anyway, my old standby, the Russian restaurant of the ever-changing name but fairly constant menu, was still there. Peter pointed out that it was in Russiatown in 2009 that we met for the very first time. I don't think I blogged that particular trip to Russiatown – I went rather frequently back in that era. 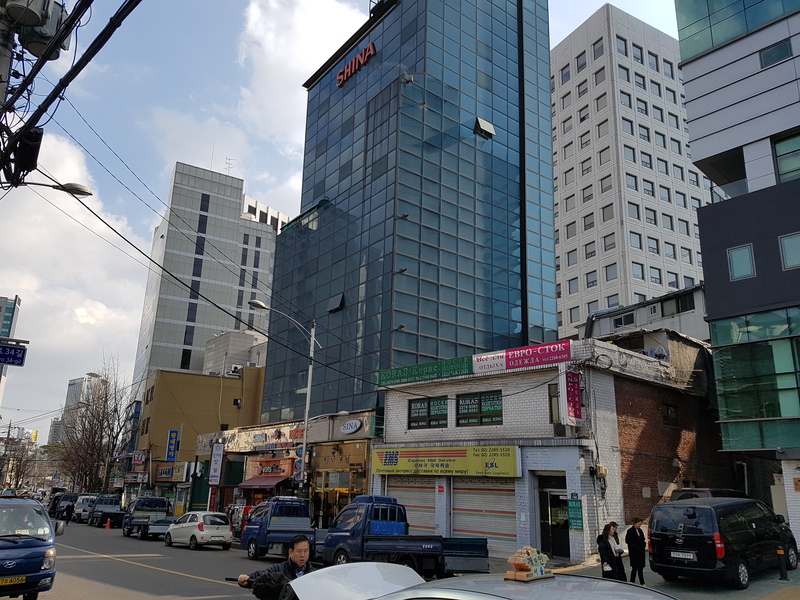 Anyway, Peter and I had lunch at the restaurant, and then met a friend of his (colleague also enrolled in the same graduate program at Johns Hopkins, apparently) and went to Hongdae briefly, where I got to visit the Korean Language hagwon where Peter studied last year some. Peter is trying to persuade me, I think, to get more serious about my own regrettable progress in the language. Certainly I feel jealous of his amazing competence in the language relative to my own. Then I went to work, taking the Gyeongui line subway route that follows the old railroad mainline to Ilsan Station. The line is several years old, now, but it still doesn't form part of my default mental map of how to get around. Here are some pictures. I think Russiatown looks much more prosperous than it did 5 or 8 years ago. 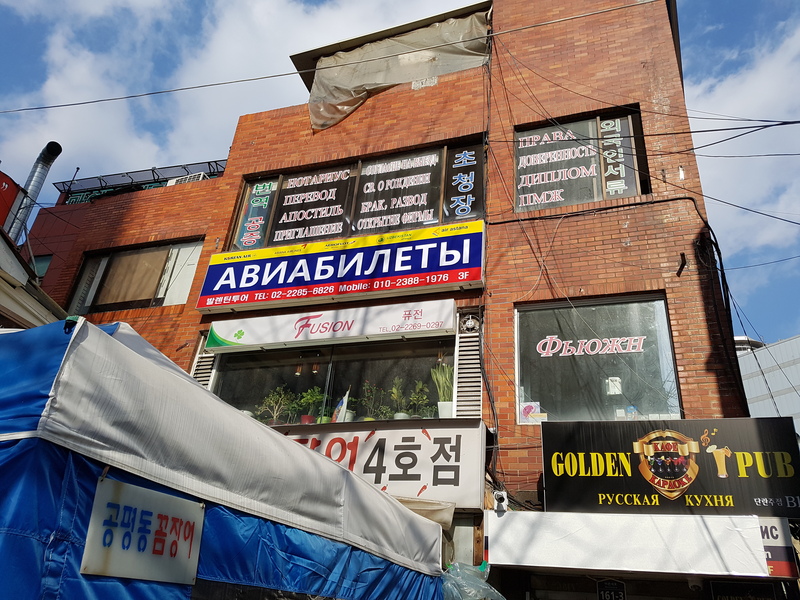 Still, there is much Cyrillic signage – not just in Russian but other central Asian languages typically written in Cyrillic, such as Mongolian, Uzbek, Kazakh and others. As I chatted with Peter, I coined a new name for the neighborhood: "Stanville." This reflects the Central Asian character as opposed to strictly Russian (all the "-stans" of the former Soviet sphere). 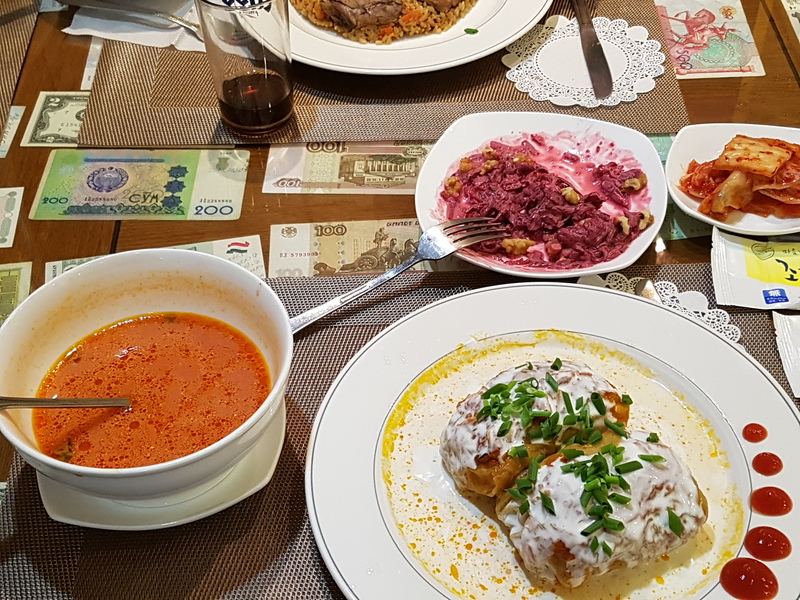 Борщ и Голубцы (borscht and cabbage rolls). I have had cravings for oatmeal (just the regular old oatmeal in a quaker oats can, or those instant oatmeal packets that abound in the US) for a very long time. But unlike almost any other product imaginable, I have had difficulty running across it. I don't even recall seeing it at Costco or at the foreigner's grocery at Itaewon. I really want some variety in my porridgey foods, rather than just Korean 죽 and 누룽지, which are both rice-based. Finally, the other day at HomePlus, I noticed this on the TESCO "foreign foods" shelf (the British TESCO is an international partner for HomePlus): "Scottish Oats" (at right). I bought some, and had some. I am happy for the variety. As many know, I still have some issues eating "normally." Aside from the fact that I don't have much sense of taste, which means that food just isn't as interesting as it used to be, I also have some issues around the fact that major portions of my tongue lack a sense of touch – it's permanently numb, like it will get after a visit to the dentist when local anaesthetic is used. A month or so ago I bought a can of olives, because I like to chop them into my pastas sometimes. But I made a mistake – they were unpitted olives. I nearly threw them out, but in fact, I do like olives, and I can still enjoy the bitter/salty flavor of them somewhat. Things with seeds or pits or bones that end up in my mouth are things I normally dread – if you think about the gymnastics you do with your tongue when you find a watermelon seed or a fish bone, you will understand what I mean. I don't get very ambitious with my cooking, much, these days. Mostly, every time I buy some food item or attempt to cook some food item, out of craving or whatever, I am inevitably disappointed. Eating just isn't fun – not even the the easiest-to-eat foods, like omelettes or noodle soup (국수) or rice porridge (죽) – at best, they are utilitarian and serve the purpose of providing me with sustenance with minimal discomfort. So mostly I just don't bother. I have my instant soup mixes and my pasta and my eggs, and I prepare them always the same way and with the least effort required, because putting in extra effort or attention to detail offers no noticeable improvement in quality-of-experience. Last night I was feeling nostalgic. I had run into a former student, Eunjin, on the street the other day, and she shocked me by running up to me and hugging me (note that Koreans are not, normally, notable for effusiveness in this manner). She is in high school now but she had always been a remarkably motivated student in the years I taught her. She told me she hated English now because of how it is taught in high school, but she missed my classes. That was flattering, I guess. Then my former coworker Ken stopped by work last night. He's left the English teaching biz and is working for Samsung in some businessman-type functionality. This is probably good for his bank account and his ambition, but may be contrary to his core inclinations. Anyway, although I don't think of him that often, in seeing him I realized I missed the constant dialogue and banter I'd had with him during our years working together. Anyway, I was feeling nostalgic, and when I get nostalgic, I sometimes find myself cooking, for no good reason whatsoever. I made pea soup. It wasn't exceptionally fun to eat, but the act of making it was enjoyable, if that makes any sense. Philip Glass, "Satyagraha (Act 1, Tolstoy)." Sometimes I get weird food cravings. I have moved in the direction of ignoring them, because every time I go to satisfy one of those food cravings, I'm deeply disappointed. My food memory is intact, but my actual taste and "mouth-feel" mechanisms are essentially permanently rearranged since my surgery. Today, for whatever strange reason, I found myself remembering and craving the birria that I used to buy as a lunchtime snack at one of the puestos on San Cosme (in front of the subway station) where I lived in Mexico City. I suppose that birria (a kind of goat-meat soup or stew – which it is depends on consistency, and the kind I got was always more brothy than stewy) would be hard to come by in Korea in any event. So it's just as well that I mostly let these cravings just pass by. But it's a fond memory in any event. Here's to birria - the picture is a random picture found online that matches what I used to get pretty closely. It's strange… the random stuff that pops into one's mind. I really have this desire to eat more healthily than I do. In trying to do this, however, I am challenged by my constant frustration around eating, which constantly leads me down a path of least resistance, seeking out "comfort" foods (which nowadays mostly means foods easy-to-eat: pasta with some mild sauce, bland rice concoctions, etc.). Today, inspired by a mound of spinach at the supermarket, I decided to try something, and made some quite passable blanched spinach with mushrooms and a few bits of zucchini and onion sauteed with garlic and butter. A whole bag of spinach wilts and reduces quickly to a single bowl full. I've always rather liked spinach, but previous recent efforts were frustrated by textural issues. This time, by de-stemming all the leaves and chopping it slightly and letting it wilt more, I achieved a squishy but still mostly fresh texture that was quite manageable. Well, anyway. The days are warming, somewhat, from the depths of winter. They have been accompanied by the terrible smoggy haze I associate with early spring in Seoul, which is probably due to a combination of the fact that winds prevail from the west this time of year with the fact that yucky-smoggy China happens to sit directly to the west. The sun in the afternoon sky was just a pale, glowing, peach-colored disk. Warpaint, "Love Is To Die." 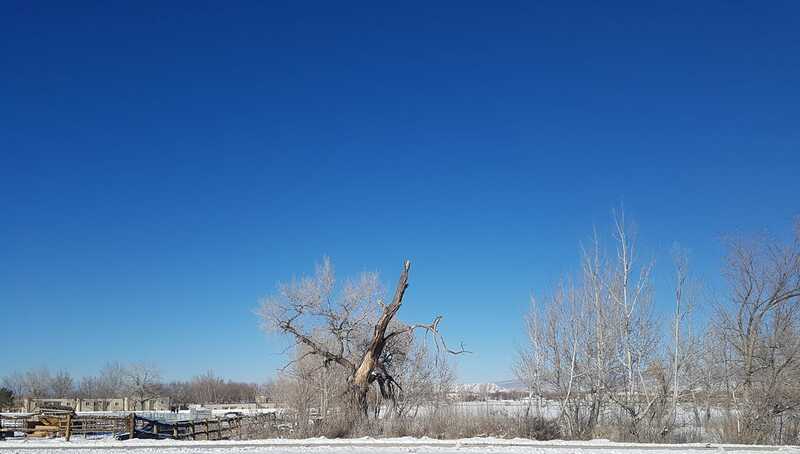 Yesterday, I spent the Lunar New Year's day alone. 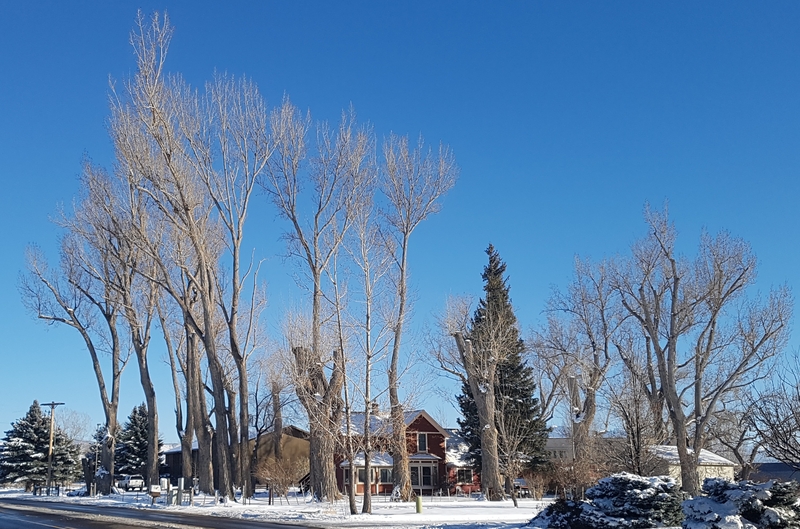 I wasn't invited anywhere and wasn't in the mood to go out exploring on my own – I think I've got a relapse of that cold I had through much of the first half of January. I really miss eating spicy foods so much. And I have felt frustrated with the slow pace of my recovery. I think sparing spicy foods completely for so long has meant that I've lost my resistance, partly, so lately in an effort to somewhat "force" my recovery, I've been sprinkling a very light dose of red pepper on my food sometimes – trying to build up a resistance. 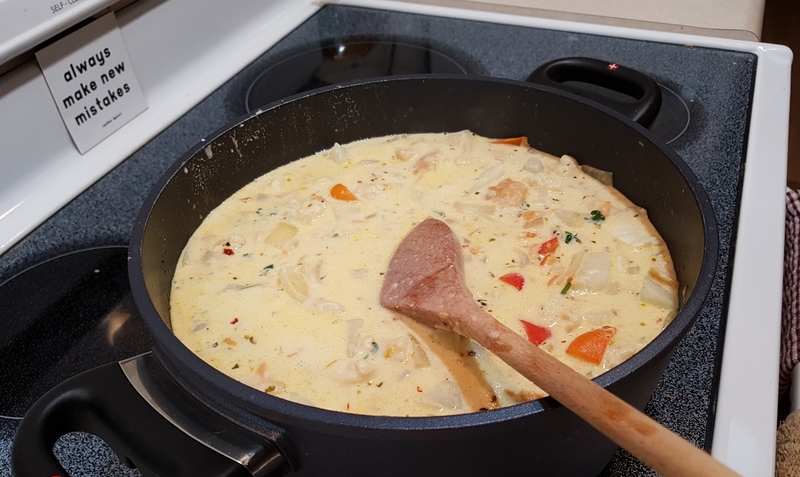 Last month I made some pre-packaged instant curry and tried to eat it and it was a kind of painful disaster – even trying the "mildest" flavor available in the store. On Sunday, I did the same thing and it was tolerable. So that's a kind of food victory. If I can work up to the "medium" flavor of the packaged curries, I might brave a trip to my favorite Indian restaurant a block from here, and have "real" curry – as opposed to the rather lousy Korean-style you can get in the curries from the supermarket. It's frustrating craving things you can't have. Tomorrow morning, I go to the hospital for outpatient CT scan and such. I'll get injected, detected, inspected and hopefully rejected – to paraphrase and repurpose Arlo Guthrie's famous meditation on the draft. It's a follow-up appointment, at the 4 month-iversary of the end of my radiation treatment. I'm past the bad cold I had for almost a month, and I've been feeling healthier, but I still have some weird paranoia about my overall health. I've always suffered from what I call meta-hypochondria – which is to say, I worry constantly that I'm sick in some way but then always and inevitably dismiss those worries as hypochondria. The problem is that sometimes those worries are in fact legitimate, such as my eventual cancer diagnosis last June. So meta-hypochondria is just as bad a condition as hypochondria, probably. So I feel worried about what they might find. And then I feel dismissive about it. Or both, at the same time: cognitive dissonance. I guess we'll find out tomorrow. There is an episode of a webcomic called "mused" (by a Greek guy named Kostas Kiriakakis) that I liked, that is far too long to reproduce (copy), here. I recommend this episode, entitled "A Day at the Park." It's about questions vs answers.